By Dan Frommer. From the archives. Thursday, October 6, 2011 at 3:46 pm. The ridiculous outrage around Apple’s iPhone 4S seems to have been quieted by Steve Jobs’ death. But for the sake of closure, I’ll be clear: There never should have been any shock around the iPhone 4S to begin with. Apple just doesn’t do major redesigns for its product every single year. 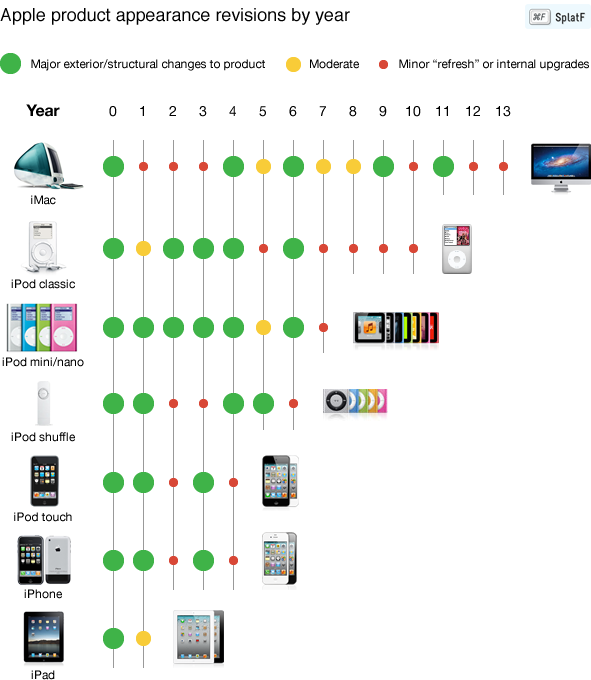 The closest was the iPod mini/nano line, which was its first gigantic consumer hit last decade, and got regular exterior updates every year for a while. This should make perfect sense, because the trend in technology has been that software, not hardware, is what is changing the fastest. And software can offer users substantially different experiences for far lower costs than hardware updates. Moreover, the iPhone is the iPhone mostly because of its software. And software upgrades — while not as tangible as a new device shape or material — are just as important to Apple’s devices and to Apple’s business. And a few notes specific to the iPhone line: Most people are on 2-year mobile contracts and don’t upgrade every year. Apple is designing with that in mind. And there are a few key things that might go into Apple’s next radical iPhone redesign that aren’t quite ready or mainstream: NFC technology and 4G LTE. As I said on Tuesday, between the next iPhone and iPad, and a potential Apple television set, Apple has now set itself up for a huge product year in 2012. Recent Amazon purchases: Zoe extra virgin olive oil, Flow lemon and ginger alkaline water, Ursa Major face wipes (great for travel!) and “You and I Eat the Same” from René Redzepi’s MAD.